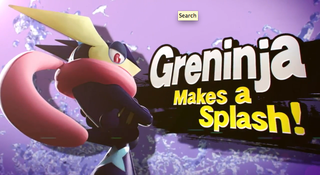 Greninja, The Ninja Tongue Pokémon, Is A New Character In Smash Bros.
A new Pokémon appears! It's the final evolution of one of the starters in Pokémon X &Y, and it's called Greninja. See that scarf Greninja is wearing? That's actually its tongue. Yuuuup. And now to look forward to smacking people with it later this year in Smash Bros.